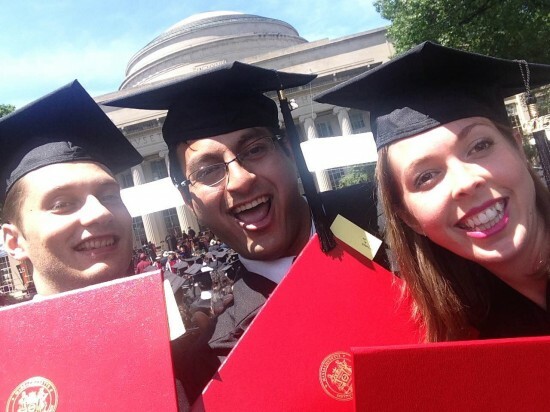 Class of 2015 MBAs Alex Smetannikov, Abhishek Syal, and Erica Swallow proudly display their diplomas after walking the stage at Commencement. I don’t claim this is a scientific survey, but before they left campus for good, eight graduates from the MBA Class of 2015 answered my question: What advice would you give incoming Sloanies? While the responses differ in some details, what they have in common is valuable guidance for future students. Harriet Barnett has worked at MIT Sloan for forty years in many different roles. Her current title is Admissions Advisor. That is so true of the Sloan experience! Look forward to being in Sloan in 2016. Youth, energy, beauty, happiness on their faces! Success to you guys! What an incredibly inspiring post! Thanks for sharing!